Educate your team on the sales process and and empower them with updated info on new model features. Plus provide a powerful collaboration tool to explain features to customers. Salespeople today deal with customers who have likely already performed extensive research about the vehicles they intend to purchase. 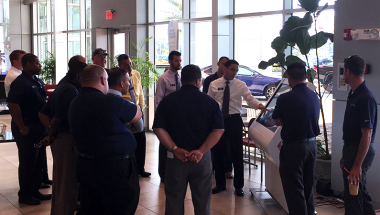 With buyers visiting fewer dealers, there is more pressure on sales agents to ensure that customers visiting their dealership make a purchase on the spot, because if the customer walks out, they are unlikely to return. The need for dealers to close the deal ‘on the spot,’ together with the high job turnover that car dealers experience, means that new sales agents will be under extreme pressure to learn about the products and process quickly. ViewPoint kiosks can help by providing a framework for the sales process, compelling product information to guide the discovery process, and easy access to very detailed product information. Interactive kiosks can help get new hires acquainted with the brand they have been chosen represent. Studying the products: Bringing an employee on board means intensive education about a whole line of vehicles. Showrooms equipped with kiosks have an easy and innovative way to pass this information on, via the same helpful graphics and detailed data sheets used to capture customers. Rich information on the fly: Even when there's a fact that a new staff member doesn't know, a few quick and easy gestures on the touchscreen call up the necessary information. Launching a new model year can go smoothly with help from kiosks. Ready for new vehicle launches: When a dealer's new vehicle lineup debuts, employees face crunch time, factoring in intense interest in these new cars and trucks and a need to get up to speed quickly. Kiosks, updated via online connectivity, will have the facts consumers are looking for. Seize the moment: Employees who study with these devices can get their own knowledge up to speed in a hurry. The beginning of a model year is a time to drive interest in a brand, and kiosks that reflect the most recent information will help employees and customers alike get in the spirit. Salespeople will likely find themselves using kiosks alongside customers, and this is a great opportunity. Side-by-side shopping: The skills that employees need today lean toward collaboration with shoppers, rather than giving a one-sided presentation. Making kiosks part of the sales process allows customer to feel involved every step of the way, as both salesperson and buyer can see the same screen. Transparency and independence: The digital era has led to customers performing their own research and putting a premium on transparent and straightforward sales processes, and kiosks can help carry this through to the in-person experience.